AUGUSTA, GA—Noting that the out-of-control individuals harassed numerous female attendees and sent the world price of eggs and pork into a free fall, PGA officials reportedly had to break up a crowd of rowdy fans who were committing commodities fraud Friday in the Augusta National’s parking lot. 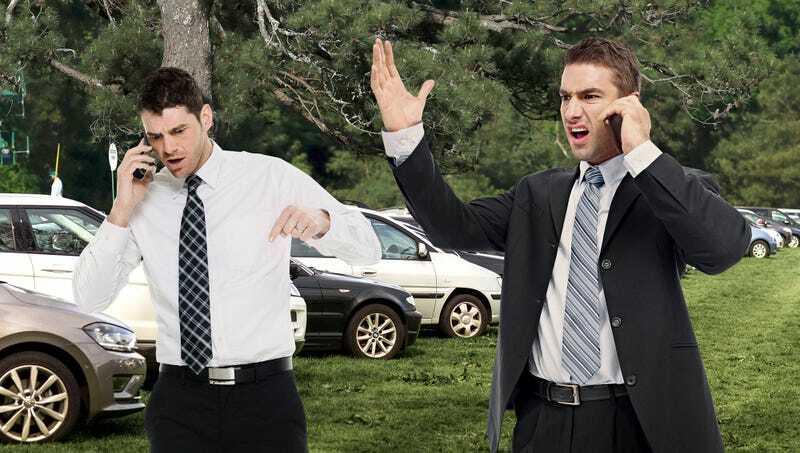 “We’ve received multiple complaints from visitors about a group of loud fans dressed in designer suits who were throwing beer cans and shouting into their phones to manipulate the soybean futures market,” said Masters head of security Peter Novello, who claimed that when approached by officials, the intoxicated men quickly scattered, leaving behind half-empty bottles of Macallan scotch and reams of overseas bank account information. “These individuals were belligerent, screaming obscenities at bystanders and demanding they invest their life savings in dummy corporations. We had to eject several fans who were gathered in a circle behind the clubhouse, getting in fist fights and throwing down their clients’ entire portfolio on roll-of-the-dice tech investments.” PGA sources confirmed that despite dispersing the group as quickly as possible, the rowdy fans had already managed to cause $5,000 in property damage and had defrauded investors for more than $27 million. Does The Younger Generation Of Call Girls Respect Tiger Woods?